Active/Retired military service members and veterans are eligible to receive discounted greens fees at Charleston Springs Golf Course Monday through Friday. Just bring a government issued ID documenting your military status in order to receive the discounted fees (no golf card is required). For information on greens fee rates at Charleston Springs, please click here. Designed by noted golf course architect Mark Mungeam, Charleston Springs North and South courses offer 36 holes of championship caliber golf. The par 72 North Course is a links style course, with expansive undulating fairways defined by native grasses and wildflowers. The course features extensive bunkering, multiple water hazards, and large immaculately maintained greens. It has a USGA course rating of 73.4 and slope rating of 126. The par 72 South Course is designed in the classic parkland style, similar to the golden age courses of the teens and twenties. The South Course utilizes existing terrain and natural features to define each hole. In the parkland style, holes are framed with sporadic trees and native grasses. There are four sets of tee markers to challenge golfers of all skill levels. The course measures 6953 yards from the back tees and carries a USGA course rating of 73.2 with a slope rating of 125. 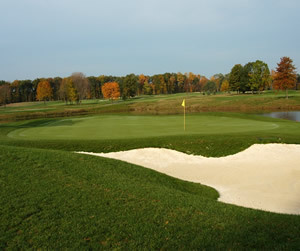 In 2007 the Short Game Area (SGA) was added. The SGA is a 5-acre complex, consisting of two chipping greens, a putting green, two green side bunkers, a fairway bunker, and an acre of fairway to practice the short game. The facility is available for use with a daily greens fee. The greens, bunkers, and fairways are maintained to the same quality as the courses to reflect exact ball reaction, as one would find on the course. SGA Rules: Clinic use has priority ~ Must have daily greens fee ticket for use. (A $10 fee, payable at the Pro Shop) applies if you do not have a same day greens fee.~ Must use own golf balls ~ Carts must remain on path ~ Repair balls, replace divots, rake bunker when finished ~ Player closest to green has right of way ~ Small range tee reserved for clinic and instructional use only. Beyond the two championship golf courses located here, Charleston Springs demonstrates how ecological considerations can enhance a recreational facility. By integrating resource conservation and ecological restoration concepts into the design of Charleston Springs, the Park System has created a golf facility that is "more than just a golf course." Tee times are available through the tee time reservation system after the purchase of a Monmouth County Resident ID card or a Non-Resident Reservation ID Card. Reserve a tee time on-line or call 732-758-8383. NEW: Non-Card Holders can make tee time reservations by calling the golf center or in person, no more than two days in advance of play. A pre-paid and non-refundable reservation fee is required per golfer reserved. Charleston Springs is located on Route 527 (101 Woodville Road) one mile north of Route 537 in Millstone Township. From the Garden State Parkway or the New Jersey Turnpike take Interstate 195 to exit 16 (Rte 537- Freehold) for 5 miles to Route 527 (left) to golf course.